A 5,000-year-old stone monument has been seriously damaged by a metal detectorist in Jersey, the island's heritage body said. 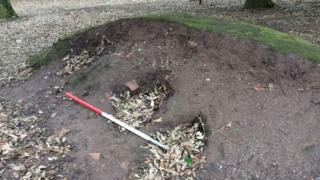 A man was spotted "illegally" using a detector and a trowel at the grade 1 listed archaeological site, Jersey Heritage (JH) said. Any activity at La Hougue de Vinde dolmen required permission, it said. Jersey Police said no-one had reported the incident to them. The dolmen, near a southerly tip of the island, is comprised of a circular group of stones surrounded by a rubble wall. It has previously been badly damaged by stone robbers, JH said. More stories and news from Jersey. Backfilled metal detecting holes in the centre of the chamber and targeted digging all over the dolmen was discovered after an inspection by Jersey Heritage's curator of archaeology. The group said it was "shocked and saddened" by the damage and asked islanders to report any suspicious activity at the island's ancient sites. Jersey has 13 major dolmens, including passage graves and gallery burials, along with more than a dozen single standing stones. They are the earliest man-made structures in the island, built by Neolithic people. President of Jersey Metal Detecting Ken Rive, said he condemned any illegal metal detecting activity. "We believe in responsible metal detecting that abides by legal restrictions and ensures that any finds can be properly researched and recorded," he said. "We would ask anyone unsure of the permissions required to metal detect in Jersey to contact the club as soon as possible."